It's hard to predict from looking at a skein of multicolored yarn what the colors will look like when they're knitted and mixed together. To visualize how a yarn behaves at different stitch counts, David (husband) made a virtual swatch of SweetGeorgia Tough Love sock yarn for me, in the Spring Garden colorway, in my gauge. If you move the blue stitch counter you can see how the patterning and coloration vary. Sometimes just one extra stitch on a row can change the look entirely. 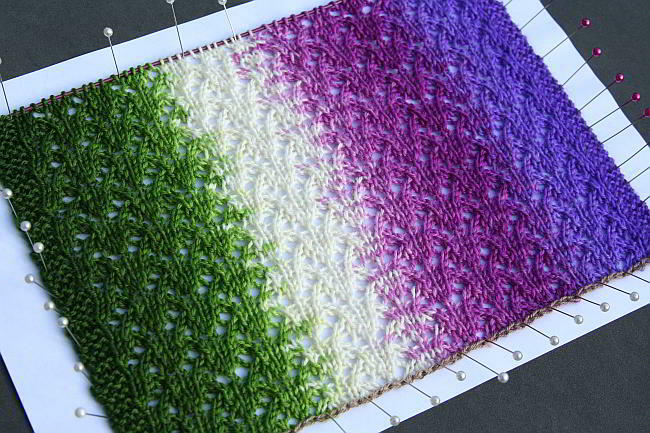 A useful property of the Spring Garden colorway is that it has color symmetry—i.e. the colors on one half of an untwisted skein are the mirror image of the other half. Line of color symmetry in the Spring Garden colorway. This means that if you start on the line of symmetry and use exactly half a round of the skein for each row, you could knit flat (i.e. back-and-forth) and line up the colors over multiple rows to form vertical stripes. If you set the counter to 55 stitches per row and click on the straight needles (for flat knitting) you'll see what I mean. I decided to use this idea and try to make a scarf that captures the color transitions I love in the skein. Before I could start, I had a few decisions to make. I needed a stitch pattern that would use the same amount of yarn on each row, while giving me an attractive flat fabric that would work as a scarf. Stockinette stitch was out because it curls too much. I didn't fancy garter or seed stitch, so in the end I went for a lace pattern. I was worried that all those knit-two-togethers and yarn-overs would make it more difficult to control the amount of yarn I was using on each row, but I thought it was worth trying. The next decision was how to cast on. I wanted the colors to line up through the full length of the scarf, including the cast on edge. This was a tricky one, because casting on new stitches takes more yarn than working them after. I also wanted to be able to add or remove stitches at either end of the first row if the colors in the second row weren't lining up properly. The crochet chain provisional cast on gave me what I wanted. As a temporary cast on, the stitches are made using waste yarn which is later removed and thrown away, so I didn't have to worry about the colors not matching with the rest of the knitting. It also allowed me to make the stitch adjustments at the edge that I wanted. I could add an extra stitch in the next chain link, or remove the end stitch just by pulling it out, without having to start from scratch each time. 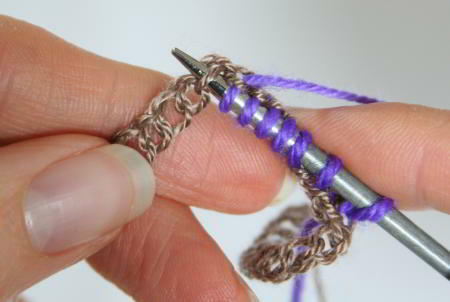 Making a new stitch with the crochet chain provisional cast on. Everything was good in theory, but I nearly gave up on the idea when I tried to put it into practice. Ensuring the point of symmetry was at the edge of the knitting was much harder than I thought it would be—I must have pulled my knitting back at least fifteen times! Eventually I realized there were some areas where I couldn't match colors between rows, however hard I tried. I guess that's not really surprising—after all, the yarn was dyed by a human and not a machine. As I made it beyond the first few tricky rows, I learnt to trust that I was on track so long as the colors at the edge matched with the rows below. Unfinished, so dry blocked to show the lace pattern. Quite a way to go, but I'll finish it! I'm happy I persevered. I love the vertical stripes of color and the way they transition across the fabric. I'll even go so far as to say I would do it again. And I'd recommend it—all you need is a skein of yarn with color symmetry and a sky-high tolerance for ripping back your knitting! P.S. If you liked this article and haven't signed up to the Yarn Geeks mailing-list yet, please use the form below.